As sad as we are to see our students leave, we are more than happy to offer support for whatever they choose to move on too. We pride ourselves knowing that 95% of our pupils will move on to university or higher education courses, going to universities all over the world. Pupils who want to jump straight into working life are offered support with talks, specialist evenings and through our school contacts for work placements and summer jobs. 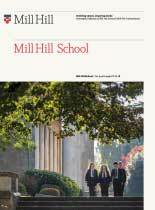 We strive to ensure that every student has the opportunity to pursue their aspirations after Mill Hill and in their future life.